FAMILY PORTRAIT: Kerie 'Kiki' Lewis-Thombs basks in the warmth of her favourite men, husband (DJ) Denvo Thombs and sons Joshua (left) and Tziyon. Yes, she’s sweet and soulful, but Kerie ‘Kiki’ Lewis is also equals parts saucy and sparkling, and beginning March 2, when she returns to must-listen radio, that sparkle will be all over Hot Fusion, her much-anticipated show on Hot 102 (weekdays 5:00pm - 7:00pm), which simultaneously sigifies her new lease on life. She exclusively opens up to TALLAWAH about the new job, resolutions, carving out a quiet normalcy with her family, and keeping an open heart in life and work. After quite a break from the airwaves, how do you feel about returning to radio, and what can listeners expect from your buzzworthy new show? I am very excited about returning to radio. I think I am even more excited about being able to have a medium within which to add humour and positivity to peoples' lives. 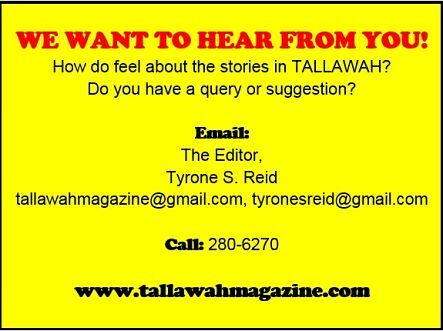 So all in all, listeners can expect light listening, lots of great advice on pressing issues that affect each and everyone of us each day and just a show that reflects the lives of real Jamaicans with a little punch to it. Why do you think 'Hot Fusion' will connect with individuals from all sectors? The name of the programme ‘Hot Fusion’ indicates that there is going to be the merging of worlds somewhat. Uptown will meet downtown, and the music play list will be varied -- a little bit of everything. ‘Hot Fusion’ will teach, expose and communicate health, social issues and graces and address budgetary concerns currently facing most of our target audience, and that is predominantly women aged 20 to 45 years. We're keeping it real, but it will be light listening. You strike me as very patient person. What roles do control and determination play in your life? I don't know if I would consider myself a patient person, but control plays a major part in my life, and it's a part of growing. I've learned that it's never okay to say the first thing that comes to your mouth; it's always better to stop and think. 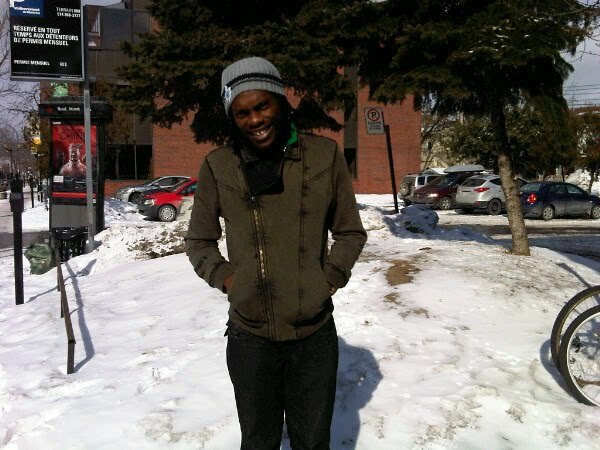 My mother always said, "If you nuh have nutten good fi say, nuh say nuttn." And those are wise words. Just as well, I try not to react to everything immediately. I am tested daily, and I have always had a temper issue growing up, but age has certainly taught me that control has to be a major part of my life. Determination is something that I do not have to search for. Thank the Lord, it is embedded in me. I was determined to get past people judging me for the skeletons in my closet, so I aired my skeletons via my documentary, with the help of AMP. And that determination has helped me to overcome a huge hurdle in my life. I must admit, it was a bit of a gamble, but it panned out, and now the future is looking very bright. Did you start the year with a particular set of resolutions? Family! Ensuring I put my family first, even if it comes with sacrifices. To achieve every goal I have ever had. Every show concept and philanthropic initiative is in motion. Just do it! What else is on your must-do list for the rest of 2011? Producing more shows. Doing my talk show. Feeding our people. Get a rocking body like Yendi. As a wifey and mother, how has home-life been treating you? (Laughs) Great, it's been a new learning experience, an emotional journey and a journey that forces you to comprehend how important your role is as a mother. You're teaching, nurturing and grooming a life. Their future is dependent on what you teach them now. Hands down it is the most fulfilling and important job I have. As a wife, my husband is my best friend. We laugh a lot, share a lot and we are always there for each other. God first, family next, and life after. How have you established that balance? It's a tedious process, one that's still being fine-tuned. Years in the biz will program you to always be prepared. Showtime is showtime. Even if your world might be crashing. Thankfully, for me, I am always able to stay professional, despite what might be happening. As it relates to work and the family, I have a good support system, family, friends etc. For emotional support my mom has been my anchor. I appreciate that. As you leap into this new phase of your life and work, would you say you are still in the process of 'finding yourself'? Yes and no. This year I'm driven to achieve. I feel that it's now or never. So many elements are present: our economy is on the decline, persons are working so hard to make it, stress seems to be at a peak. But truthfully I refuse to give in; giving my all is all I have to give. I love learning. A big lesson for me, very poignant, is to get things done then speak about it, not to speak about what’s to come. After all you've endured in the past couple years in your personal and professional lives, has your philosophy on life changed? What is your primary outlook on the world? I GOT YOU, BABE: Kerie and hubby Denvo are picture-perfect in this scene from their life together. THE QUEEN: Natalie Portman wins Best Actress for Black Swan at the 83rd Academy Awards in Los Angeles. The curtains came down on the 2011 awards season on Hollywood's biggest night, the 83rd Academy Awards tonight at the Kodak Theatre in Hollywood, which got a very youthful slant thanks to the efforts of hosts James Franco and Anne Hathaway. 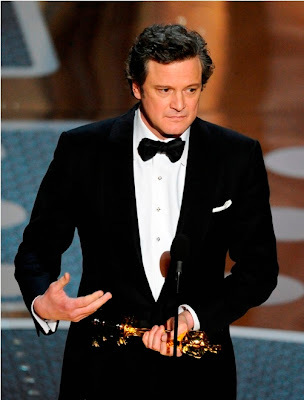 EXTRAORDINARY GENTS: The Fighter star Christian Bale took supporting actor honours; (above) Colin Firth was named Best Actor for The King's Speech, which was crowned Best Picture. Hot mama! Best Actress winner Natalie Portman wowed us in this violet silk chiffon draped gown from Rodarte that nicely covered her baby bump. Love her! Oscar and Grammy winner Jennifer Hudson went with this bold tangerine creation from Versace. Love the hair, too! One of my favourite looks on the red carpet. Black Swan actress Mila Kunis turned heads in this gorgeous Elia Saab Haute Couture lavender chiffon gown. The boldest statement-maker of the night, presenter Cate Blanchett rocked this artsy Givenchy Couture creation and made it work. Love it! Best Actress nominee Michelle Williams (Blue Valentine) is a regal mamacita in Chanel Haute Couture. The simplicity of this dress is absolutely divine, perfect for Michelle's customary fashion tastes. Anne Hathaway cuts a stunning figure in Valentino. Hathaway co-hosted the show with James Franco. Last year's Best Actress winner Sandra Bullock is red-hot in Vera Wang. Presenter Halle Berry opted for a lovely Marchesa corset gown, perfect for her curves. Best Supporting Actress nominee Amy Adams (The Fighter) is radiant in an L'Wren Scott design and a reported $1.35M worth of Cartier emerald and diamond jewelry. New Spider Man star Andrew Garfield is dashing in Louis Vuitton. Garfield's movie The Social Network took home the Oscar for Best Adapted Screenplay at the awards. Ladies, get ready for some real girl talk. The local television landscape is about to get an injection of oestrogen with the arrival of Woman 2 'Ooman, an exciting 60-minute programme geared at facilitating the exposure and discussion of issues affecting women in the Caribbean. The show, a bonafide coming attraction, is being presented under the auspices of DMH Productions. “It’s going to be great! A live discussion programme hosted by women sharing ideas and solutions for gender issues,” gushes producer Dahlia Harris. 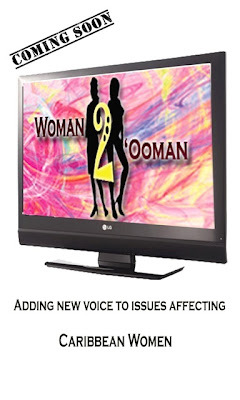 While there’s no word yet on when the pilot episode will arrive, Woman 2 ‘Ooman will be aired on CVM TV during the Prime Time slot on Sundays (9:30pm to 10:30 pm), presented in a manner that resonates with a large female audience. Viewer participation on the programme will also be heightened through live interactivity via phone and Internet, as well as through vox pops gathered islandwide. KEY ISSUES: PM Bruce Golding addresses the Ramphal Commission on Migration and Development on Wednesday at the Mona Visitors Lodge, UWI. State Minister (Foreign Affairs and Foreign Trade), Senator Marlene Malahoo- Forte (left), former PM PJ Patterson (2nd right) and Labour minister Pearnel Charles also participated in the Commission. Prime Minister Bruce Golding has said that migration can play a significant role in global development, but globalization is hardly likely to advance if people are not able to move, if not freely, at least with less impediments. He was addressing commissioners of the Ramphal Commission on Migration and Development at the Mona Visitors' Lodge, UWI Mona on Wednesday. Mr. Golding said migration is one of the most powerful currents shaping global society; however, he noted that “the danger is that in the absence of a global framework built through cooperation and partnership, the effects will be lopsided and will serve to aggravate already stark imbalances between developed and developing countries.” The Prime Minister also said he agrees with the idea advanced in the Report of the Commission that countries like Jamaica must see migration as a strategic policy option and not as a means of losing the country’s brightest and best or the unburdening of low-skilled workers. “It should not be seen also as merely a source of remittance flows, important though that is. There is a vast job market beyond our shores. Rather than bemoaning the brain drain, we might better take advantage of those opportunities and train our people for as many of those jobs we can fill,” he said. Mr. Golding recommended that the Commission consider the effect on families and children in particular, of absentee parents, which is a common consequence of migration. “Some attention needs to be given to providing a more structured framework for mitigating the negative effects that this has had and continues to have,” the PM said. The Ramphal Commission on Migration and Development is an arm of the Ramphal Centre, and the University of the West Indies. It was established in 2009 under the leadership of former Prime Minister of Jamaica, P J Patterson, to study and make recommendations on issues concerning migration and development in Commonwealth countries. The Commission also seeks to advise Commonwealth governments on how they might adopt mutually beneficial and practical policies to maximize the benefits of international migration. 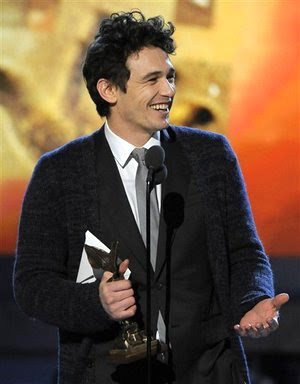 LAUGHING IT UP: James Franco wins Best Actor honours for 127 Hours at the 2011 Independent Film Awards in California on Saturday, a day before he hosts the Academy Awards. 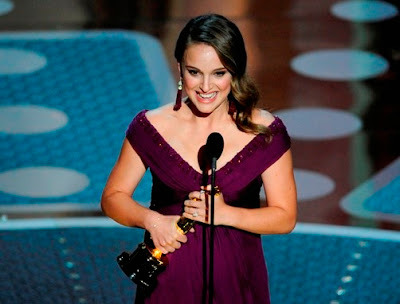 Oscar Best Actress frontrunner Natalie Portman (Black Swan) and Best Actor nominee (and host) James Franco (127 Hours) walked away with the top acting honours at Saturday's staging of the 2011 Film Independent’s Spirit Awards, which took place in Santa Monica, California. Black Swan, one of my most-enjoyed and best-reviewed films of 2010, won all four of its nominations, including Best Feature, beating out Winter’s Bone, The Kids Are All Right, 127 Hours, and Greenberg. Stars of Winter's Bone (a Sundance fave), John Hawkes and Dale Dickey, won the supporting trophies. HAPPY HEART: Natalie Portman gushes to the audience after winning Best Actress for Black Swan at the 2011 Spirit Awards in California. 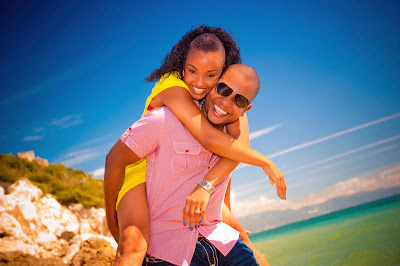 UNTO US A CHILD IS BORN: Reggae gospel singer Jason Mighty and wife, Nicole, are now proud parents, following the birth of a bouncing baby boy on Wednesday. The child is their first together. 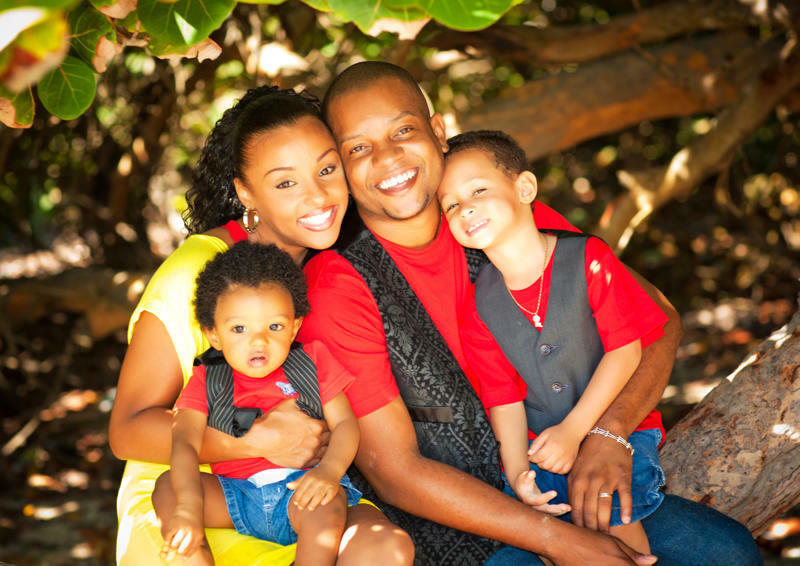 In relating the news to his Facebook family, Mighty said, "Father, I thank you that you have brought my son safely on Earth. Thank you for helping my wife to give birth to him and still be alive. Today I'm the happiest father on Earth." Congrats and best wishes to Jason and Nikki. In the meantime, Jason is prepping for the release of his long-awaited second album, Temple of Praise, the follow-up to his critically acclaimed debut Cornerstone. New singles to look out for include "Praise I Do" and "Mighty Man in Battle" (featuring Prodigal Son). MUSIC OF THE HEART: Great news! Reggae-rock songstress Tessanne Chin has graciously heeded our requests for physical copies of her stunning debut album, In Between Words, to be made available for purchase. We couldn't be happier. Copies are now available at select locations in Manor Park. In my recently published review of the album, I noted that I was "unable to own a physical copy of the album as it was released for the market solely as a digital product, available for MP3 downloads via iTunes and Amazon." But that's a thing of a the past, based on the news Tessanne recently shared with her Twitter. So go pick up a copy of the amazing record; it's a solid and stellar debut effort, a musical tour-de-force too good to pass up. GIRLS' NIGHT OUT: Yendi and a pair of Digicel girls look uber-cute at the Bacchanal Opening Night in New Kingston earlier this week. Judging from these vibrantly colourful looks, spring is certainly in. 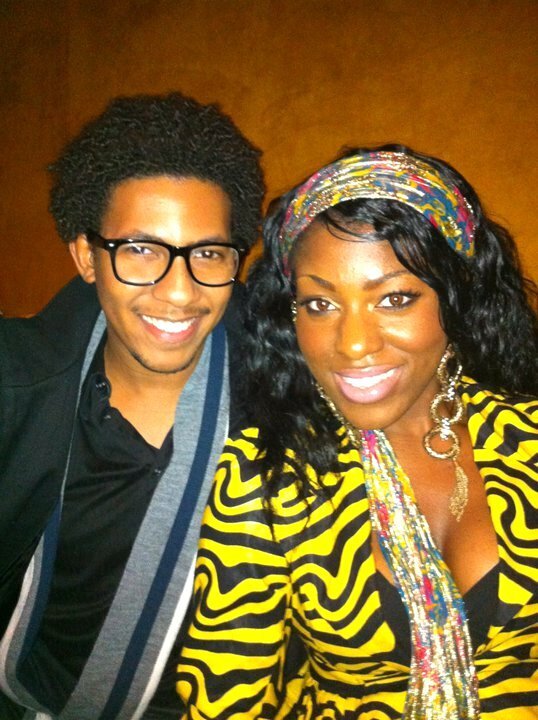 DYNAMIC DUO: Singer-songwriter Mario Evon perfects the geek-chic look in the company of friend Simisola Olabisi in New York recently. 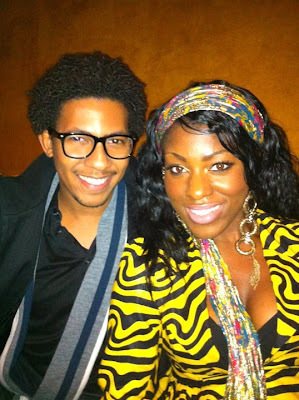 The twosome was spotted at a Grammy party at Jay Z's 40/40 Club. As he gears up for the release of his debut album, Evon has announced that he's forming bands in New York and Boston, and will be hosting auditions for prospective members. SNOW MAN: Obviously feeling the big chill, music producer/artiste/radio host, ZJ Liquid gets a taste of the unpredictable Canadian weather while in Montreal for a show this week. 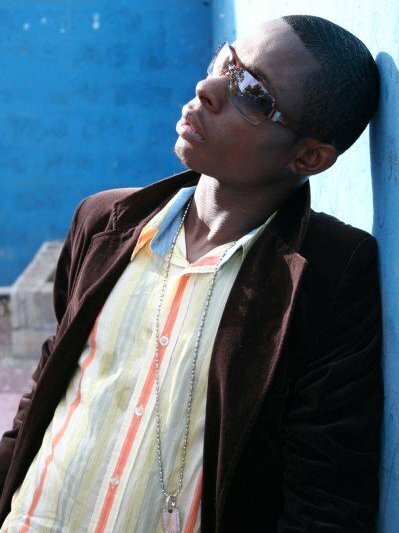 Last year, Liquid ruled the airwaves with his radio hit "Wifey Walk Out" and took home the Youth View Award earlier this month for Favourite Selector. 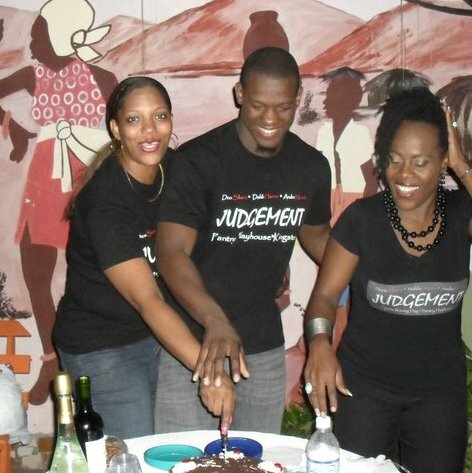 LET THEM EAT CAKE: The cast of the hit play Judgement (Dahlia Harris, Andre Morris and Deon Silvera) celebrate their 50th performance with cake and champagne at the Pantry Playhouse in New Kingston earlier this week. On Monday, Harris won the inaugural Thespian Spirit Award for Outstanding Supporting Actress. 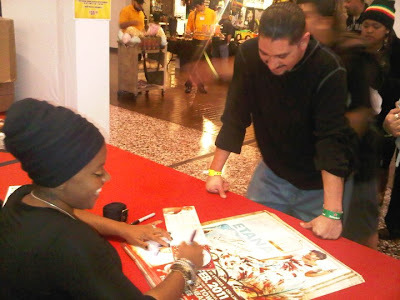 MEET AND GREET: Singer Etana, currently on tour in North America, signs posters and autographs for fans during a stopover in Los Angeles recently. Etana is in the midst of a promotional campaign in support of her latest album, Free Expressions, which debuted in the #11 spot on the Billboard Reggae Album Charts. THE GOOD FIGHT: The Social Network versus The King's Speech for the grand prix at Sunday's Oscars. One of the most meandering awards seasons in recent history comes to an end on Sunday night when the charming duo of James Franco and Anne Hathaway preside over Hollywood's biggest night, the 83rd Annual Academy Awards. Will The Social Network regain its vigour to fight off The King's Speech's late award-season surge to win the grand prix? Will Annette Bening pull an upset win over Best Actress frontrunner Natalie Portman? Will Melissa Leo's controversial campaign ads cost her the supporting-actress win? Obviously a lot has gone down since I last reported from the sidelines. And at this point, while Sunday’s winners include some surefire victors, beyond that it’s anyone’s guess. So how is the field looking at this point? Here’s my final rundown of who will go home with a trophy – and who truly deserves a lifetime with the little gold man. Will win: In spite of the controversy she has invited upon herself within the past weeks, Melissa Leo is still the safe bet in this category for her thoroughly believable turn as matriarch Alice Ward in The Fighter. Also working in her favour are her important wins at the Screen Actors Guild, Golden Globes and Critics’ Choice Awards. Should win: I’m not a supporter of self-promo campaigns when it comes to awards shows, so you can imagine my disappointment to learn that Leo had been “pimping herself” via glamour-shot ad campaigns to appeal to Academy voters to “consider” her. Tacky. (Sharon Stone’s stunt with her Casino nomination comes to mind). As such, an upset looms in this category, with Hailee Steinfeld (True Grit) or The Fighter costar Amy Adams set to capitalize should Leo lose massive votes. 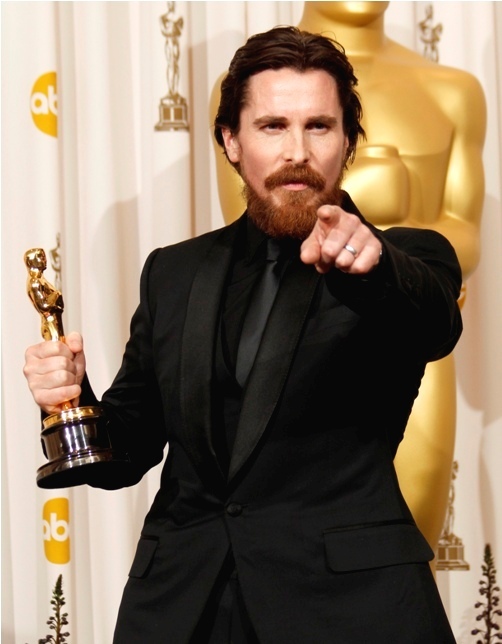 Will win and should win: With Andrew Garfield (The Social Network) out of contention, my vote falls unequivocally to Christian Bale, who has been cleaning up at pre-Oscar shows all season. As washed-up, drug-addicted boxer Dicky Ward in The Fighter, Bale is simply a knockout. It’s an utterly committed performance in the vein of his work in American Psycho and The Machinist. Will win and should win: Very few acting performances can move me to tears, and Natalie Portman accomplished that very feat with her exquisite, out-of-this-world performance as unstable ballerina Nina Sayers in Black Swan. Devastating by circumstance and phenomenal in scope, Portman’s performance is unbeatable! Sorry (again), Annette. Will win: In The King’s Speech, Colin Firth magnificently imbues the stammering King George VI with dignity, shades of vulnerablity and ultimately hopeful courage. It is very rare to feel sympathy for an individual so privileged, yet Firth’s monarch is someone you find yourself rooting for. Therein lies the true power of his performance. Should Win: Still, for my money, Jeff Bridges (True Grit) gave the most engaging performance by any male lead on-screen last year. Humorous and unforgettable, his Rooster Cogburn is constructed from the stuff of legend. Will win and should win: Deservingly heraled as the strongest contender in this category, Fincher (The Social Network) is indeed the obvious choice for masterfully helming the most talked-about film of the year, drawing amazing performances from a young cast, led by Jesse Eisenberg and Andrew Garfield. Will win: The King’s Speech. The successful late surge this season has practically secured this simple British period-piece affair the grand prix. I still say this film earns much of its glory just for its excellent climax. The rest feels very TV-movie-ish. Should win: The Social Network. A film with way more emotional heft and a far more appealing story, Network certainly deserves the win, but I fear it will go the way of Avatar. LIFE LESSONS: McHugh shares her expertise with a student during a course at the Bars To Go Training Institute. Highly proficient and incredibly successful in the hospitality industry, Bars To Go boss Patrice McHugh has climbed her way to the top and is determined to play her part in nation-building by giving back. 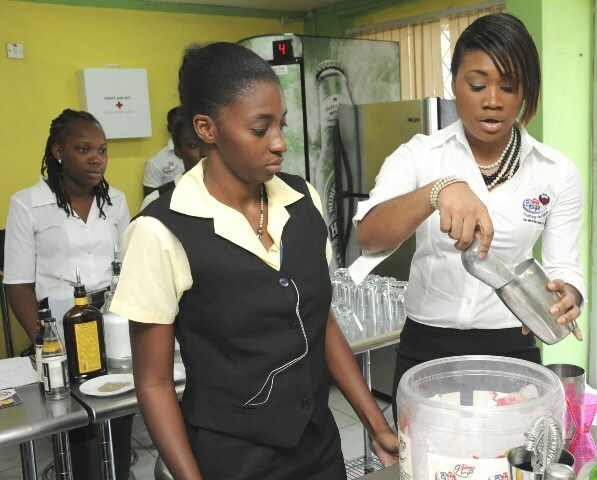 Now president of the 33-member Jamaica Bartending Guild, and Jamaica’s first master mixologist, McHugh dishes to TALLAWAH about her involvement with Project Tourism, a new initiative that seeks to change live by providing job opportunities for some 300 inner-city residents, and why she is overwhelmed by her success. Why was it important to help bring a project like this to life? I thought it was important to give persons from the inner-city a chance for upliftment of themselves because some are not able to get jobs and education, so it was a perfect opportunity for them. So when Red Stripe approached me I knew it was great idea, and something I would love to be a part of. With a great deal of young person set to benefit, are youth issues something your company is passionate about? It is something I am passionate about and I was very touched by the fact that I would able to help some young people. Because for one thing, I am a product of the inner-city, and I love to give back. What next do you hope to tackle? What we’ve been concentrating on is since 2010 is building the training institute and we’ve been getting positive reviews. We are also working hard at elevating the hospitality profession in Jamaica. And for the rest of this year, we hope to expand to the the rest of Caribbean, starting with Trinidad. Personally, how do you feel about giving back? It makes me feel good inside because I never thought I would ever be this successful in life to the point where I have been named one of the best mixologists in the world by Don Julio magazine. So it is a bit overwhelming.